In light of the decision of the International Whaling Commission to move to biennial meetings, this new, online, free access biennial series ‘Report of the Meeting of the International Whaling Commission' has replaced the previous Annual Report series. The first biennial Commission meeting took place in 2014. This series contains the Chair’s report of the biennial Commission meeting including the reports of its associated Committees, sub-committees and working groups. It also contains the reports of any ‘in-person’ Bureau meetings and intersessional meetings and technical workshops workshops, held in the two-year period prior to the biennial meeting concerned. The report of the annual Scientific Committee meeting will continue to be published in the Supplement to the Journal of Cetacean Research and Management. As in the previous Annual report series, this series also contains the text of the Convention and its Protocol, and the latest versions of the Schedule to the Convention and the Rules of Procedure and Financial Regulations. For free access to Rep. Mtg Int. Whal. Commn, click here. Cite as: J. Cetacean Res. Manage. Authors wishing to submit a paper to the Journal, please click here. The International Whaling Commission has always placed great importance on science. 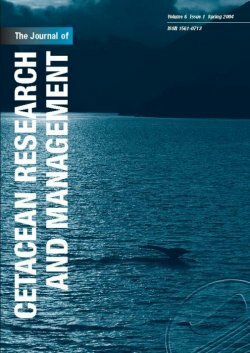 Since 1999, it has published the Journal of Cetacean Research and Management. This peer-reviewed Journal contains high quality original scientific papers on the conservation and management of whales, dolphins and porpoises. Since 2014, as part of the Commission's philosophy of making the best scientific information available to all, the Journal has been available with free access online. An annual Supplement contains the full report of the Commission's Scientific Committee annual meeting along with the reports of any specialist scientific workshops held in the year prior to the Scientific Committee meeting concerned. An occasional Special Issue Series publishes peer-reviewed papers on specialist scientific topics. To date these are (1) Chemical Pollutants and Cetaceans (1999); (2) Right Whales: Worldwide Status (2001); and (3) Humpback Whales: Status in the Southern Hemisphere (2011). For free access to J. Cetacean Res. Manage., click here. For free access to J. Cetacean Res. Manage. (Supplement), click here. For free access to J. Cetacean Res. Manage. (Special Issue), click here.